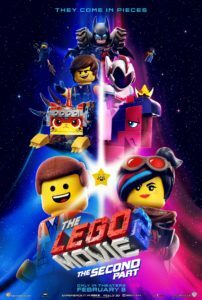 Before we get started, I have a confession to make: the first time I watched the original Lego Movie, I was very ‘meh’ about it. I put this down to a combination of watching it at home rather than at the cinema (there’s a good chance I missed large chunks whilst cooking the kids dinner) and my unrealistic expectations. There were just too many unfamiliar words and phrases to keep track of while also looking after two small children. (Master Builder is a pre-existing title, and I’ll let that slide. But The Special? Kragle? Piece of Resistance? Man Upstairs? Relics? Takos? Plus names like Vitruvius… It was a bit much for a kid’s film in my opinion). But I have watched it at least 20 times now and use phrases from the script in my everyday interactions with oblivious adults, and count these as signs that the film is a favourite. I had none of these problems with The Second Part. We saw it at the cinema this afternoon. The kids are now old enough to sit quietly (although my 6-year-old had to be reminded not to give us a constant re-cap on how funny things were). I was possibly more irritating to the members of the public with whom we shared our viewing experience, because I was laughing loudly for pretty much the entire 107 minutes it was running. There was a bit of exposition but as it tended to be presented in song form (and this itself tied in with the theme and didn’t seem as irritatingly out of place as it might have) it didn’t slow the pace down. Also, we had the benefit of knowing in advance that this was a game being played by real children, so clues in names like ‘Systar System’ made it easier for older kids (ie the ones not simply enjoying the bright colours and tunes) to follow. So, what should you expect? You’ll find it funny even if you don’t know the first movie, but you’ll spend a lot more of your time trying to work out what’s going on if you haven’t seen it. Fans of the fantasy / sci-fi genre come in with a massive advantage, in that this is basically an homage to SFF popular culture. Mad Max. Twilight. Star Wars. Jurassic World, Harry Potter (“You are such a Hufflepuff!”). ALL the Batman incarnations. Highlight for me was the tour of the miscellaneous time travel devices, which featured a hot-tub. I would say 75% of the humour went over my kids’ heads. This is pretty standard for animated movies (and always has been, on both large and small screens. But that’s a conversation for another day) and this probably makes it funnier. Everyone likes that sense of superiority they get as they notice a subtle reference that everyone else misses. That’s why Infinity War was so enjoyable, despite being totally bleak. That’s why I love Buffy so much (“Avengers: Assemble!”). Rex Dangervest’s intro montages are a delightful parody of Chris Pratt as a human being, which only persons aged in double figures enjoyed. My eight-year-old and I had a conversation about Bruce Willis trapped in air-vents after we got out, but a joke’s never as funny if you have to explain it to someone. The rest is mostly slapstick, and kids love that stuff. The banana that always falls down the stairs. The skateboarding velociraptors. Pretty much everything Will Arnett’s genius Batman does. They weren’t laughing as hard as I was, but they were buzzing when we walked out into the glare of the foyer. And a lot of the gags ran over from the first instalment, especially the relationship between Superman and Green Lantern, and Will Ferrell off screen calling “Honey, where are my pants?” at the end (even my six-year-old spotted that one). My eight-year-old and I are both big fans of the Captain Underpants books, mostly because of the transparent fourth-wall. There was plenty of self-referential humour present, from Batman’s sly mention of his ‘side project’ between films to the feminist critique of The Lego Movie by Lucy and General Mayhem. Probably my favourite part of the film was ‘Super Cool’, the end-credits track, and those lyrics from Lonely Island had me cracking up on a whole new level. The story itself isn’t especially great. We’re kept on our toes by the constant flitting between the ‘make-believe’ level of the story with the live-action scenes (and references to it). I’m not sure why going past the stair-gate was like travelling at warp ten (possibly the scene followed Mike Mitchell from Trolls Holiday). The real-world scenes threw me completely in the first film. They are less surprising this time around, though also more frequent. Apart from anything else, they’re less colourful and exciting, and the toddler sat next to me started to get bored during them. There’s also a moral to the story, just as there was in the original. Sure, it’s entertainment aimed at children, but it still felt cloying to me. 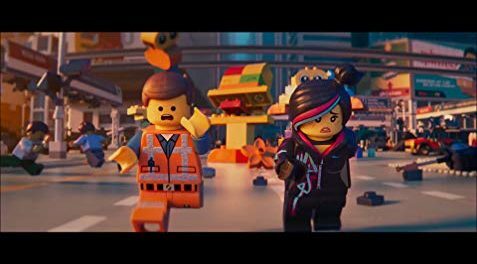 My main problem with The Lego Movie 2 was the haphazard use of time travel. Again, the causality problems would never cross the minds of the target audience, but it’s one of those things that a sci-fi fan gets angsty about. And the fantasy purist in me was outraged that a speculative element was added at the real-world level. I can feel my pulse racing now at the very thought of it. I mean, what were Lord and Miller thinking?! Possibly they weren’t thinking about the reactions of obsessives like me. And actually, at the time of watching, the film was so enjoyable that I was willing to suspend my disbelief / outrage (incredible, I know). But really, the story is just backdrop to the stunning visuals, insanely cheerful soundtrack (both kids were singing ‘Catchy Song’ when I put them to bed this evening) and constant stream of jokes. And we all knew this when we bought our overpriced family ticket. The film was one of the funniest things I’ve seen in a while (Disenchantment on Netflix comes in a close second) and making the story ‘better’ or less saccharine wouldn’t increase my enjoyment by much. So, in conclusion, it wasn’t perfect, but it was so hilarious, I didn’t really care. Great fun for grown-up nerds, and pretty good for their kids too.